I moved to California last year at this time and because I was such a newbie to LA, and didn't have a clue of even where to go, I wasn't able to attend the Season 3 Premiere of True Blood. I was very disappointed that I couldn't go, so I made up my mind, then and there, that I wasn't going to miss it this year! Therefore, on Tuesday, June 21, I went to the Arclight Theater in Hollywood to participate in the "fan experience" at the True Blood Season 4 Premiere. 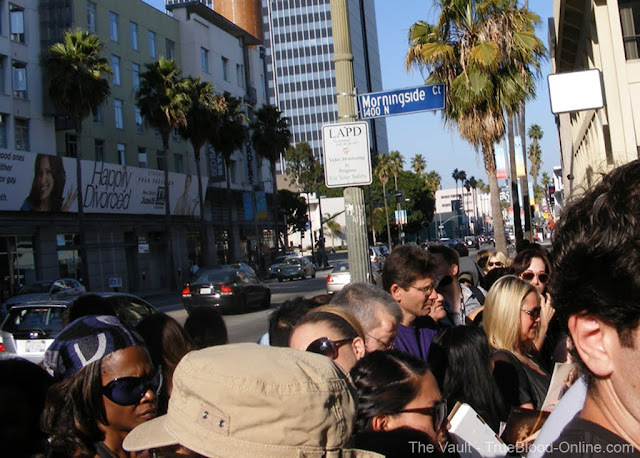 I had arranged to go with some friends and we were originally planning to arrive at the Arclight Theater around 2pm, but when I woke up on Tuesday morning, there was a text telling me to get there double quick because the line of fans had already started. I quickly got all my supplies together, Sharpies - check, 3 magazines to have Alex, Ryan and Stephen sign for charity - check, cameras (video and still) - check, as well as, all the other stuff I would need. Once I had all I needed packed up, I headed to the theater in downtown Hollywood. I was there to meet up with the cast of True Blood and get Alexander Skarsgard, Ryan Kwanten and Stephen Moyer to sign magazines for our 2011 Fundraiser. When I arrived at the theater, I was OK because there weren't a lot of people there yet and we were first in line. 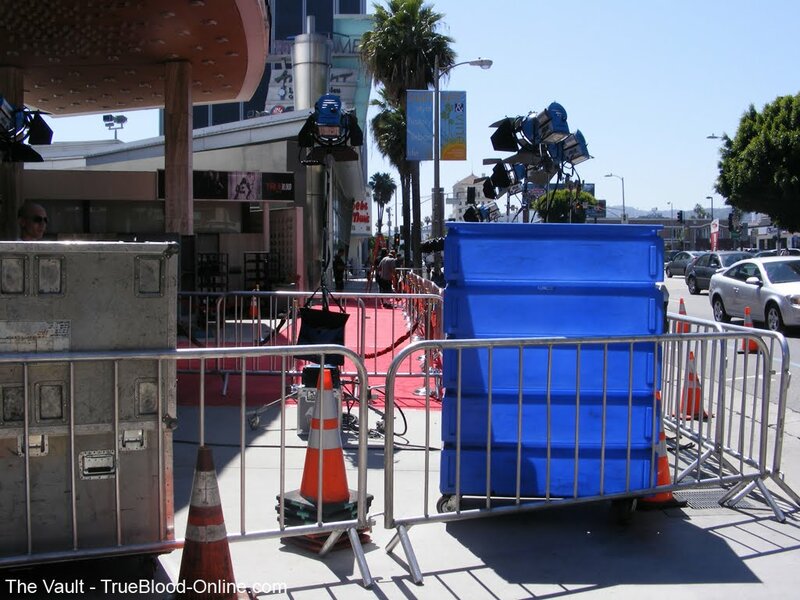 Also, neither the red carpet nor the barricades had yet been set up. My friends were all anxious for that to happen because they wanted to insure a prime spot and they couldn't do that until things got set up. They had arrived well before me (they were kind enough to save me a spot), and weren't going to give up first in line to anyone. I was glad to be with them; they are pros at attending these sort of events. At about noon, the trucks arrived with all of the equipment, and the first thing they did was set up the fan section. It was very close to the red carpet this year and therefore, much easier for the cast members to see the fans and come over to sign autographs and say. "hello." Yea, a real piece of good luck! Trucks getting ready to set up the red carpet area. This is all the gear used for setting up. This was our view of the red carpet. It was a beautiful sunny day and everyone was excited that things were finally beginning to happen. It wasn’t very hot, probably about 80 degrees (26c), but when you are standing in the sun with no shade for 10 hours, and smashed up against a lot of hot fans, it really was stifling, in our spot behind the barricades. This was where the fans were to be contained, as I later started referring to as, “the cage“. It was about four people wide and produced a long line that extended around the corner. We got right up front in the most “prime” spot which enabled us to see all the action and to attract the most attention. While we were waiting I must have consumed two bottles of water, but yet was still thirsty. As the day wore on, the technology really started to appear with lots of lighting and camera equipment needed for the event. Also, more and more fans began to show up. 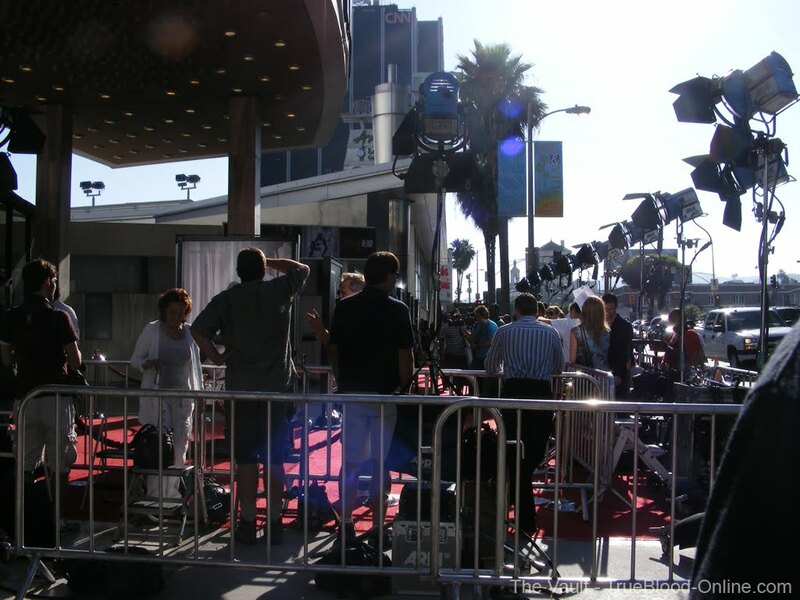 It seemed like the sun would never stop shining on us, and we wilted more and more, but when the press arrived, even-though we knew they would block our view of the Red Carpet, our spirits perked up. 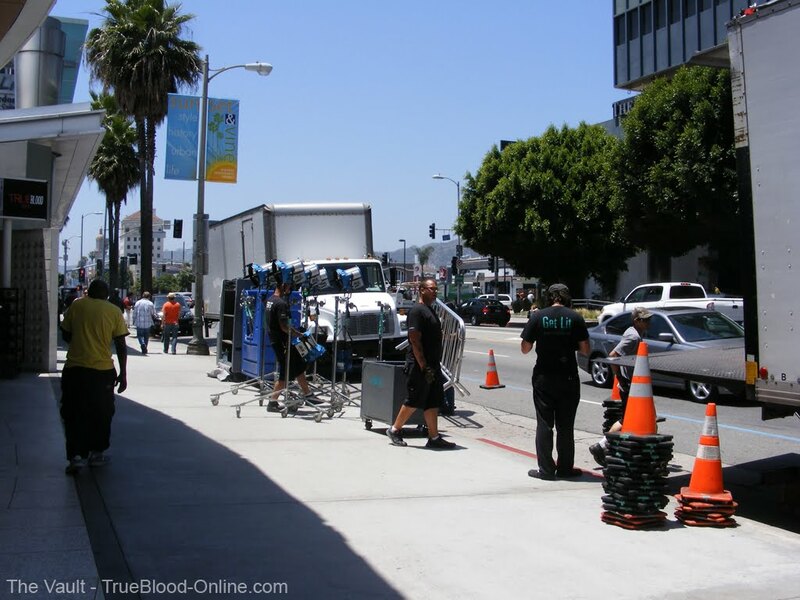 At least now that the press were in attendance, we knew that the True Blood Cast couldn't be far behind. And about 6pm or so, the cast did begin to arrive. The first one on the red carpet was Tara Buck, who plays Ginger in the show. I know Tara and she is the sweetest and nicest, not to mention a really talented person. When she came up to me, she gave me a big hug and said she loved the Vault. Jim Parrack, also came directly to me first and gave a big hug and a hello. That was the way for me, most of the time, many cast members thanking me for the work that Shadaliza and I do on The Vault. I'd like to send a special "thank you for stopping by and saying, Hi to the Vault" to Alexander Skarsgård, Jim Parrack, Kristin Bauer, Chris Bauer, Deborah Ann Woll, Anna Paquin, Stephen Moyer, Tara Buck, Ryan Kwanten, Lauren Bowles, Nelsan Ellis, and Sam Trammell. There were lots of new cast members that I met at the event, and it was nice to see them, too. I have nothing but wonderful things to say about all the cast and crew of True Blood; they are the nicest bunch of people you could ever meet. Then things started to really pick up and lots of cast members began arriving quickly. We could see them from our location, but there were so many cameras and press people in front of us, it was difficult to get any really good photos while they were on the red carpet. 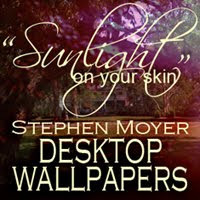 Photos can be found in the Photo Gallery. Below are several videos of the cast documenting the experience of them among the fans to sign autographs. True Blood Cast sign autographs at True Blood S4 Premiere #1 - Kristin Bauer, Marshall Allman, Jim Parrack, Carrie Preston, Brit Morgan, Fiona Dourif and new cast members. True Blood Cast sign autographs at True Blood S4 Premiere #2 - Tara Buck, Joe Manganiello, Deborah Ann Woll, Chris Bauer Sam Trammell, Todd Lowe and new cast members. Once the cast went into the theater, the fan experience was over for me. However, some of the fans decided to stay until the screening of Episode 1 ended in hopes of seeing the cast's departure to the after party. I wasn't up for that, so I went home. If you want to see some "departure and arrival videos", we have them on the Vault that you can see by clicking here. Thanks to all the cast for being so generous to their loyal and devoted fans!